CARACAS/SAN CRISTOBAL, Venezuela (Reuters) - Venezuela's opposition-run congress on Monday declared a "state of alarm" over a five-day power blackout that has crippled the OPEC member country's oil exports and left millions of citizens scrambling to find food and water. Much of Venezuela remained without power on Monday, although electricity had largely returned to the capital of Caracas following an outage that began on Thursday and which President Nicolas Maduro has called an act of U.S.-backed sabotage. The outage has added to discontent in a country already suffering from hyperinflation and a political crisis after opposition leader Juan Guaido assumed the interim presidency in January after declaring Maduro's 2018 re-election a fraud. "Nothing is normal in Venezuela, and we will not allow this tragedy to be considered normal, which is why we need this decree of a state of alarm," said Guaido, who heads the legislature, during the session on Monday. The constitution allows the president to declare states of alarm amid catastrophes that "seriously compromise the security of the nation," but does not explicitly say what practical impact such a declaration would have. Guaido has been recognized as Venezuela's legitimate leader by the United States and most Western countries, but Maduro retains control of the armed forces and state institutions, and the backing of Russia and China, among others. Oil industry sources said that exports from the primary port of Jose had been halted for lack of power, cutting off Venezuela's primary source of revenue. During the legislative session, Guaido called for a halt in shipments of oil to Maduro's political ally Cuba, which has received discounted crude from Venezuela for nearly two decades. The deals have drawn scrutiny from the opposition and its allies abroad as Venezuela's economic crisis worsened. "We ask for the international community's cooperation to make this measure effective, so that the oil the Venezuelan people urgently need to attend to this national emergency is not given away," Guaido said. U.S. National Security Advisor John Bolton backed the measure, writing on Twitter that, "insurance companies and flag carriers that facilitate these give-away shipments to Cuba are now on notice." He did not specify any measures the U.S. government may take. Earlier on Monday, the U.S. Treasury imposed sanctions on a Russian bank over its dealings with Venezuela's state-owned oil company PDVSA and Secretary of State Mike Pompeo criticized Russia's Rosneft for buying PDVSA oil. The blackout has left food rotting in refrigerators, hospitals have struggled to keep equipment operating, and people have clustered on the streets of Caracas to pick up patchy telephone signals to reach relatives abroad. 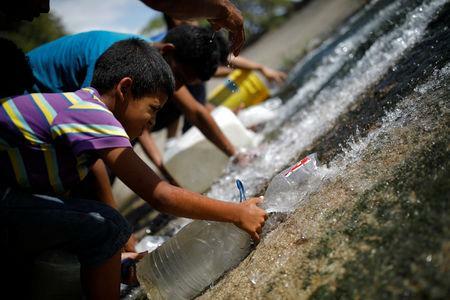 On Monday, Venezuelans seeking water formed lines to fill containers from a sewage pipe. "This is driving me crazy," said Naile Gonzalez in Chacaito, a commercial neighborhood of Caracas. "The government doesn't want to accept that this is their fault because they haven't carried out any maintenance in years." Venezuela's electrical grid has suffered from years of underinvestment. Restrictions on imports have affected the provision of spare parts, while many skilled technical personnel have fled the country amid an exodus of more than 3 million Venezuelans in recent years. Winston Cabas, the president of an electrical engineers' professional association, told reporters that several of the country's thermoelectric plants were operating at just 20 percent of capacity, in part due to lack of fuel. He said the government was rationing electricity. The process of restoring service was "complex" and could take between five and six days, he said. "We once had the best electricity system in the world - the most vigorous, the most robust, the most powerful - and those who now administer the system have destroyed it," he said. A source at PDVSA also said the government had decided to ration electricity, in part to supply power to the Jose oil export terminal. Experts consulted by Reuters believe the nationwide blackout originated in transmission lines that transport energy from the Guri hydroelectric plant to the Venezuelan south. The lack of electricity has aggravated a crisis in Venezuelan hospitals, already lacking investment and maintenance in addition to a shortage of medicines. School and work activities are set to be suspended on Tuesday, the third working day in a row.